Discussion in 'Music, TV, Movies & other Media' started by Smartmouthwoman, Jul 29, 2012. Nothing better than snuggling up under the a/c and watching classic movies all afternoon. I may try it today! Gorgeous George, Talon and (deleted member) like this. Great Idea Smarty. How ya doing today. Baby's day out is really a very funny movie. Hiya OT! Funny clip... like it! Thread idea came from a new member... hope he sticks around to join in. Well welcome and how do there river rat. Where do you hail from. 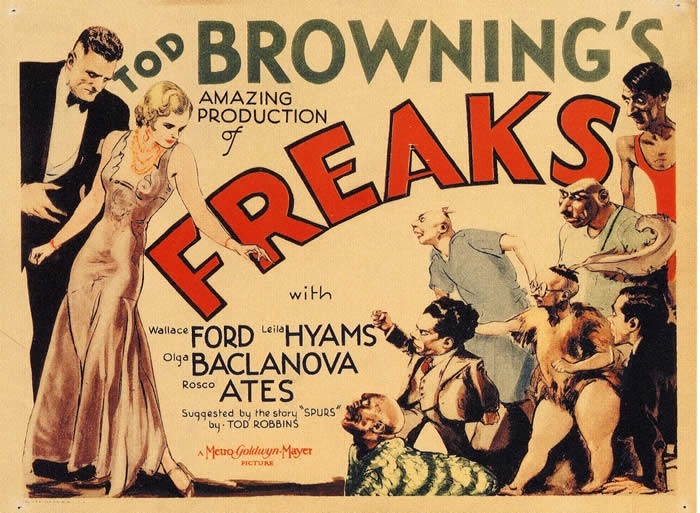 One of my fav cult films... Freaks, 1932. I watched Wuthering Heights not long ago. Ahhhhh, Heathcliff. Meet me one the moors one more time. Best moral: from House of Dracula, try to cure one monster at a time. 12 Angry Men and Night of the Hunter are my favorite classics. His Girl Friday comes third. Laurence Olivier was a good looking man when he was young and for that matter he was even good looking as an older man.. They don't make em like that anymore. Best Lesson: from The Rocky Horror picture show.....Don't dream it, Be it. Always liked Wallace Ford.He's my kind of guy.Straight-talking and to the point. Somewhat gruff and crusty but then that's what a Grandpa is supposed to be portrayed as. maybe an old father type. somewhat in " a Patch ". there were basically only 2 actors in movies that were perfect for the camera. overall camera presence.One was Gary Cooper and other was Marilyn Monroe. It got me to thinking.I never viewed another Cooper role in the same light. Steve McQueen aren't big talkers.I still like those big talkers,however. Nothing better than a Wallace Beery or a Marie Dressler. - Dinner at Eight - I adored the entire cast. The very crotch of the Tri-State area. Where Ohio, Pennsylvania and West Virginia slap together. There used to be four great old movie palaces in town, not there are only two screens in the entire county! Scene that changed my life: Nice! Thinking about that I'd have to say Sidney Portier slapping the old school racist in right in the greenhouse in In the Heat of the Night. Favorite director? Frank Capra or, if feeling pretentious, Stanley Kubrick. But I'm a sucker for Hal Ashby, Robert Altman, William Wyler and John Ford. I've never considered best credits, but Saul Bass did a great job on North by Northwest. Best comedy? Modern: The Big Lebowski classic Mr. Blandings Builds his Dream House. LOL - You're as bad as my wife, Smartie. Saturday mornings are TCM time at our house. How about the sceen when the freaks crawl through the under brush and 'transform' the haughty (*)(*)(*)(*)(*) into the "Duck Woman"?! If I could have watched Tod Browning direct his actors and camera men, it would have been facinating! Robert Mitchum calling "Children!" still put a corkscrew up my spine! While I consider Saving Private Ryan the greatest war movie ever made, one can't help but be impressed with The Longest Day, especially for that time. Ever since I was a kid, I've loved THE GRAPES OF WRATH. Read the book and I must've seen the movie 100 times. It was only after I became very interested in politics (about 4 yrs ago)... that I realized what a leftwinger treasure that movie really is. Now I can't watch it without picking out every 'we deserve entitlements' 'the govt is bad' 'rich people are stingy' 'the law picks on po' folks' message that movie sends out... and man, there are a bunch of 'em! Too funny. I liked it better when I was oblivious to all the political nuances. Glad you found the place, RR. If I may ask you a question? Someone called you 'sistah' earlier and I referred to you as him. Which is correct? Thx... enquiring minds, ya know? While I'm not a big fan of the story and the script, Orson Welles' direction and Gregg Toland's cinematography in Citizen Kane are nothing short of brilliant. Many filmmakers and cinematographers consider this the greatest film of all time. It ain't 'sistah', it's 'mistah'!